Our children’s classes are curriculum based and focus on the holistic development of the child. It is our belief that through using fun, exercise, self defence and discipline it will promote a happy healthy child better equipped to face what lies ahead of them in life. Our programs have been known to increase confidence, improve behaviour and concentration whilst also equipping children with a multitude of new skills. In order to progress onto the next grade (coloured belt) forms are filled in by parents and teachers on that child’s conduct over the past few months. Only if satisfactory or improved behaviour reports are received will the child be able to progress onto the next grade. An action packed class with weekly themes to help concentration. 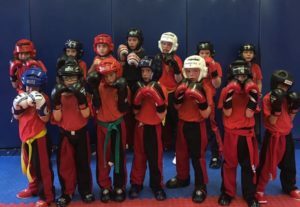 The class has energy bursts of fitness, technical skills time and games all woven together to make it a very busy fun packed class. As well as promoting martial arts and fitness we also spend time on safety awareness. Stranger danger and fire safety are just some examples of the extra to curriculum work we do. This very popular class follows a curriculum of grades to which each child trains towards. Fun team games improve agility, balance, fitness & coordination. New skills around self defence and martial arts are learnt and improved on each week. A fun packed class in which confidence and concentration are improved. Dealing with bullying and first aid are some of the extra curriculum work the students learn.